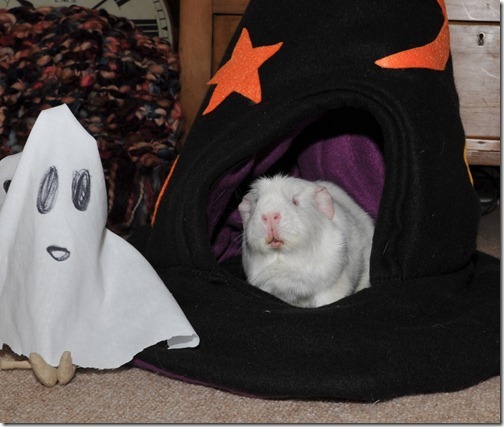 It’s Halloween but don’t worry – there are NO such thing as GHOSTS! And if there was a GHOST? Yikes! 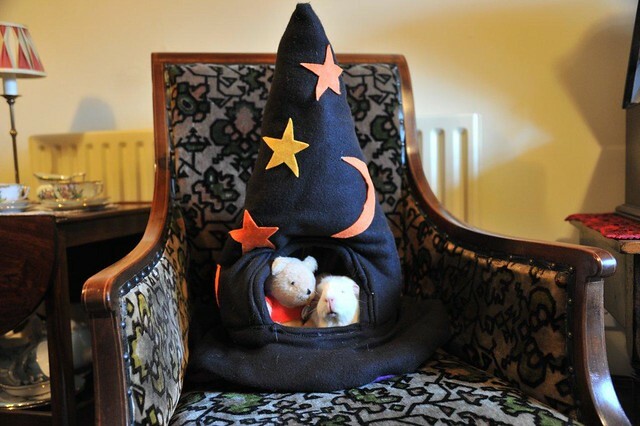 I’d get in my magic hat . 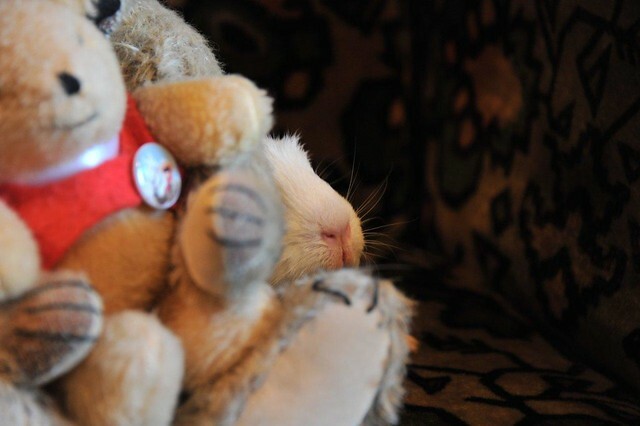 . . with Mr Bear to protect ME! All this talk of silly ghosties has made me want a cuddle . . . not that I am frightened or anything, you understand. 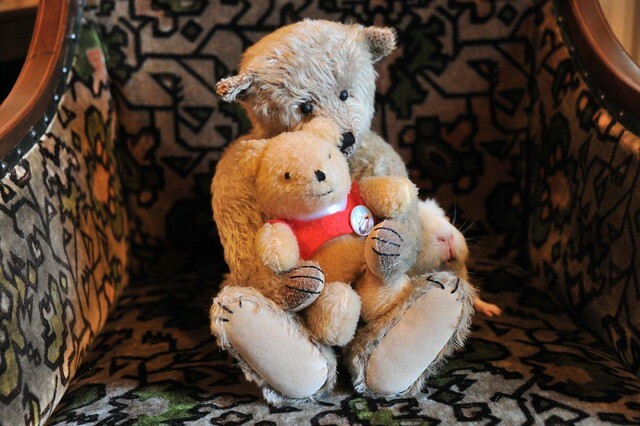 Mr Bear – are YOU frightened? Silly Billy-Bear! There’s nothing to be scared of . . .
. . . is there? I think I will just hide . . . I mean SIT here for a bit. Fairy: Welcome to ‘Fairy Asks The Big Questions’ and an extra big, piggy-type welcome to my Mummy who has kindly agreed to be interviewed today. Mummy, your life changed on June 11th 2009, can you tell us why? Mildred: I certainly can! That was the day a small ball of white fur appeared on our lawn! 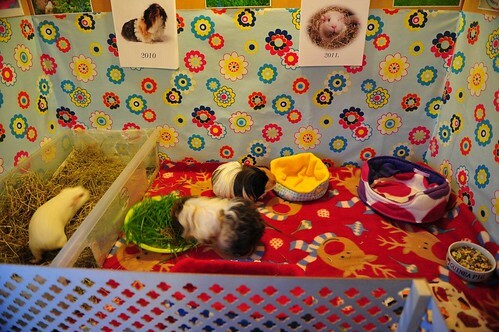 A few short weeks before, me and your Daddy rescued a family of guinea pigs from a horrible home. 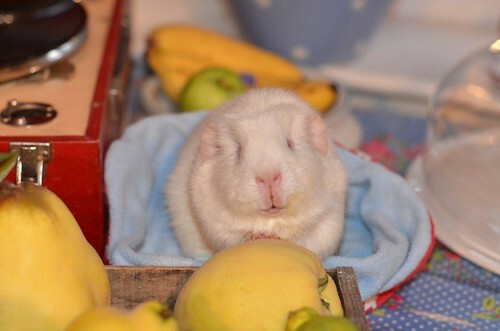 It soon became clear that before we could find them good homes Brillo, Panda and Maybe were all pregnant, and Ernie or Ted, the other two of the five guineas we rescued that day, were the likely fathers. It was a beautiful sunny day and the whole piggy family were enjoying the fresh air in their special lawn enclosure. At 10am I looked out the window and there, before my disbelieving eyes, were three extra mini pigs! 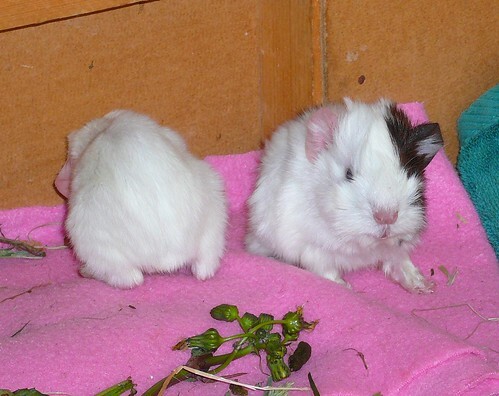 Brillo had had her babies, Flash, Jiff and YOU – Fairy! I rang your Daddy at work, ‘Come home quick! We have babies’! Fairy: Yes, yes, yes that’s all very interesting and everything, but I’m sure everyone wants to know more about me and why I am so special. 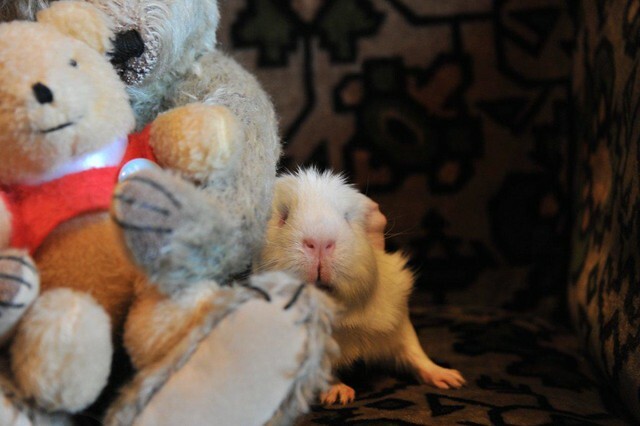 Mildred: You are indeed a very special little piggy. 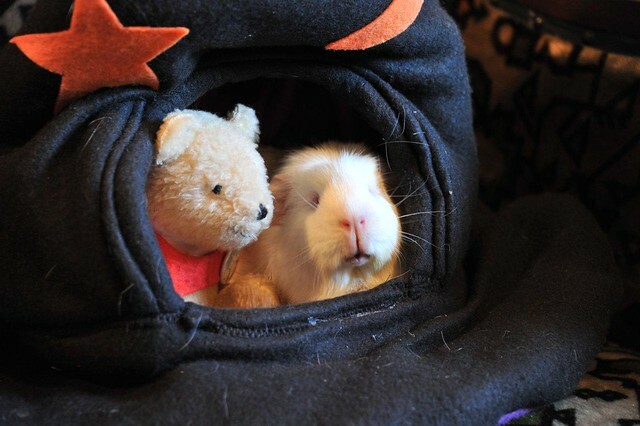 When Fairy was brand new, Matilda and Marigold went to great lengths to try and make sure she knew what’s what when they went to play in their very own Playhouse: Where the food bowl was, who sleeps in what bed and the best piggy games to play. But it seemed Fairy wasn’t paying attention, because she always seemed to be in the wrong place. She missed the tastiest food and always ended up snoozing on the least comfortable of beds! 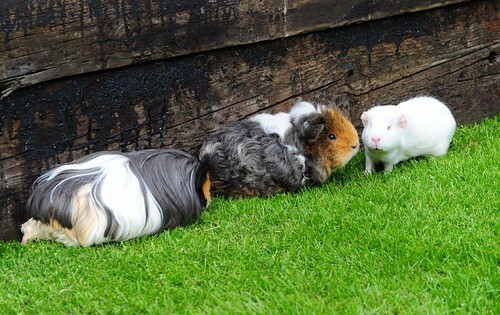 For some reason baby Fairy kept bumping into her big sisters and generally getting under their paws. While Marigold didn’t mind this odd piggy behaviour too much (possibly because of her extra thick padding she hardly noticed! ), it really upset Matilda. It took a couple of weeks before they, and me and your Daddy, understood exactly what was going on. You see the reason for your strange behaviour Fairy, was that you were born both totally blind AND deaf. 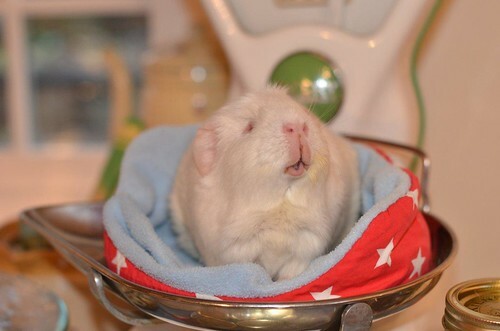 You are what is known as a ‘Lethal White’ Guinea Pig. 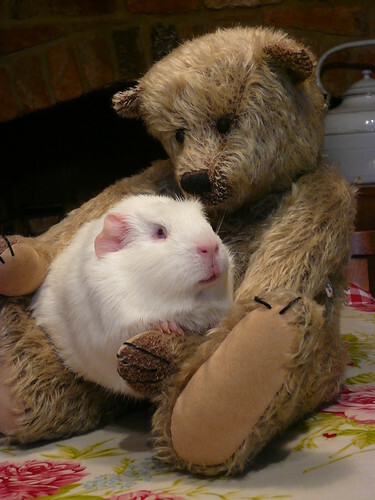 Fairy has a condition brought about by certain genes present in some breeds of Guinea Pig parents. 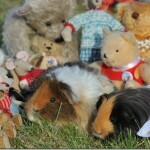 When those Guineas get together all manner of bad things can occur. 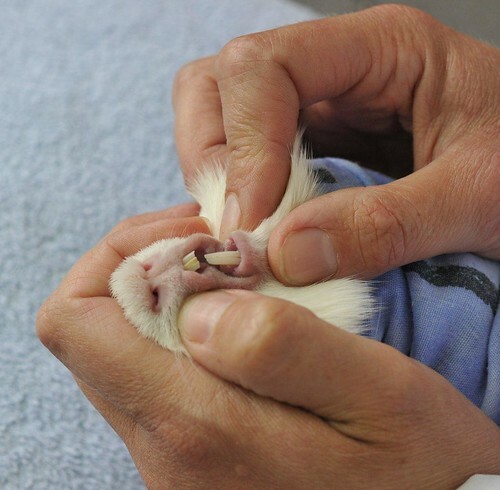 ‘Lethals’ can have short, difficult lives suffering major problems with their teeth, skeleton and internal workings. Seeing a baby Lethal struggling to find her mum, hay and food, is an object lesson to us all that we should never allow our Guineas to breed. 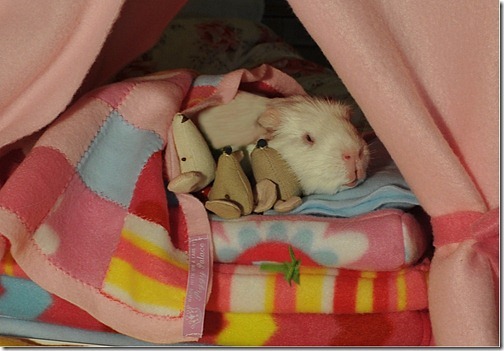 We make sure Fairy has the best life possible, with lots of love, understanding and cuddles, and good healthcare. What she lacks physically she more than makes up for in personality. Fairy is very loving and likes nothing more than to snuggle up for a snooze on a comfy lap, dreaming away for hours on end. Or better still, being hand fed choice bite sized morsels in between back scritches. She loves being with her sisters too. 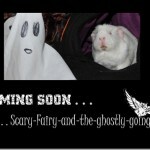 Fairy: Right, enough of all that complicated soppy stuff – time to get to know the real me. Tell the readers about a typical ‘Fairy Day’ and don’t forget to mention ‘snacks’. 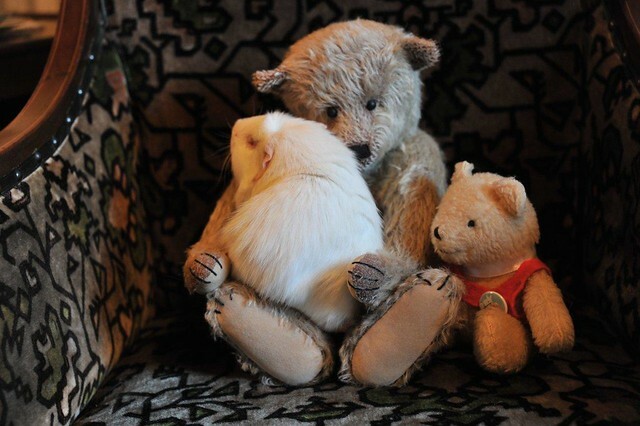 Mildred: Well, Fairy, right from the beginning we wanted you to enjoy a full piggy life, doing all the things that ‘seeing and hearing’ Guineas do, although we had to make a few special arrangements to make that possible. For a start it became obvious that you memorised the layout of your living room. So we made sure we didn’t move things around, causing confusion and a bumped nose! To make sure we don’t startle Fairy and cause her to jump out of her fur, we tend to let her know we are there by blowing gently on her when we approach. When it comes to being scooped up, Fairy has trained us to place our hands down so she can step on to be hoisted in to the air. Fairy: Much nicer than being grabbed round my tickly middle bits! Which reminds me – tell everyone about my special toothy pegs. Mildred: Okay. Because your front teeth don’t meet properly Fairy, it can make it very difficult for you to pick up your salad; therefore we slice your food up into neat Fairy-bite sized matchstick bits. We found a good dentist too; someone who could trim and file your teeth and ensure they wouldn’t cause you any problems. The dentist trained me. So now we can deal with your naughty teeth whenever they need it. 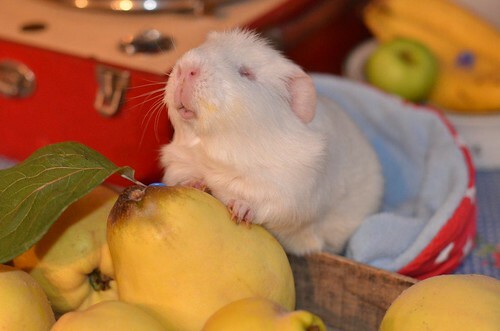 I am proud to say you have always been the perfect piggy-patient, Fairy! Fairy: That’s all well and good (and next time I see that Dr Lisa-the-dentist person, I will try and remember to give her a good strong nip for her troubles) but tell the readers what happens when I get up! Mildred: All our family arise at 6.45am. More often than not Fairy is wide awake, spick and span after her morning wash and brush up – but sometimes she is fast asleep. She takes some shaking to wake her up, and in those early days THAT was a BIG worry! 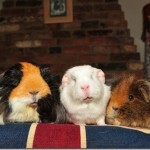 Waking a blind and deaf guinea can mean quite a lot of gentle attentions. 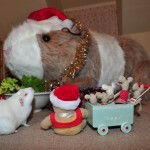 After an enormous breakfast Fairy and her adopted sisters, Marigold and Mariella, are transported by basket to their Piggy Playhouse. 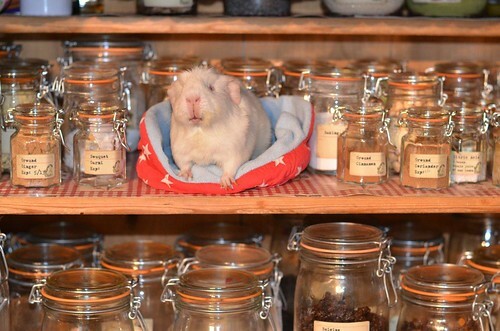 This heated and air conditioned building in the garden gives them room to play, exercise in the Pignasium, recline on well puffed up cuddle cups and generally ruminate on the meaning of life. Meals are served regularly throughout the day – after elevenses, lunch at midday, and afternoon tea follows at 2pm prompt. On warm, sunny days the gang spend a couple of hours out on the grass in their secure ‘lawn run’. Fairy is transported back to the kitchen for a snooze around 3pm with Marigold and Mariella making their way back at 4pm. After their tea the girls enjoy an hour’s floor-time before supper is served! Fairy is escorted to her own bedroom, complete with en suite dining room, at 10pm. 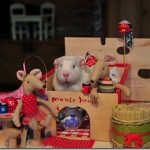 Fairy: Thank you Mummy, but I’m not sure you mentioned my ‘Fairy Stories’ featuring all my furry friends enough! 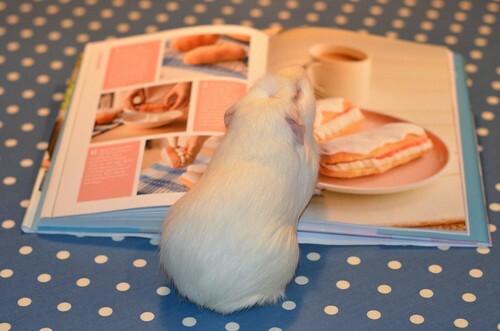 Maybe my new Guinea Pig Today best friends would like to read some of them for themselves. 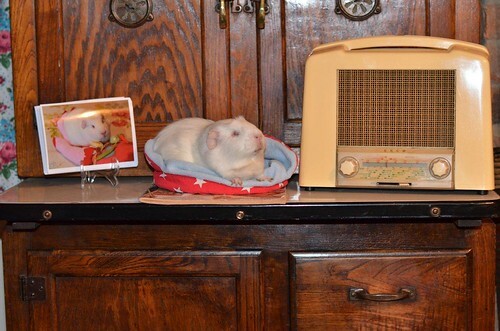 Mildred: Well Fairy, we will have to see about that! I think the readers may have had quite enough ‘Fairy’ for one day! And besides, it is time to get a certain little lady tucked up in her bed! Hey, Mum! What are we doing with these Quincey type fruits then? Oh well, I did ask. Looks like my salad, all sliced up properly! 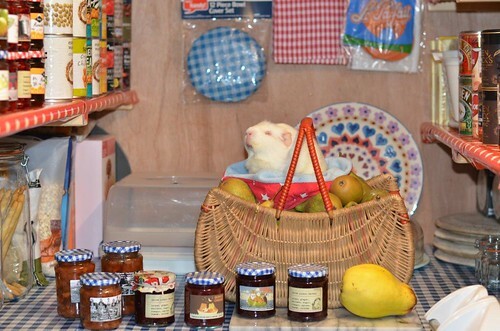 We made chutney – lots of chutney! Now then, what shall we make next? A treat for mummy and daddy, for making lots of lovely salads for me! Are the cakes ready yet? Hurry! I am a salad-pig myself but even I could be tempted by these sticky fingers! 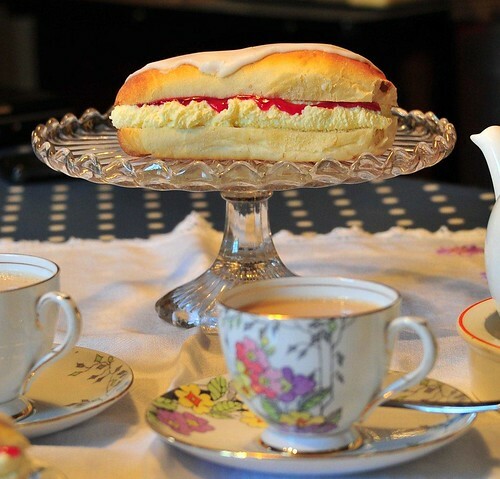 We’ve had a smashing day, busy in the kitchen, but it must be MY teatime now. That’s it! 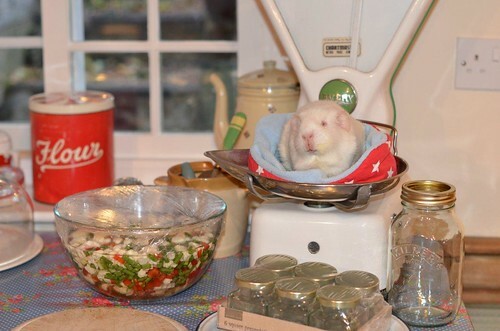 I am fed and watered and now it is time to settle down to my favourite radio programme – Desert Island Salads!